Race Point Publishing, 9781937994341, 176pp. Named by Huffington Post as one of the "Top 10 Food Blogs to Watch" in 2013, Sally's Baking Addiction has skyrocketed in popularity since its inception in late 2011. Baking addict and food blogger, Sally McKenney loves to bake. Her famous Salted Caramel Dark Chocolate Cookies won Nestle's Dark Chocolate contest in 2013, and now, in her first cookbook, Sally shares her baking secrets with fans everywhere. Try her No-Bake Peanut Butter Banana Pie, her delectable Dark Chocolate Butterscotch Cupcakes, or her yummy Marshmallow Swirl S'mores Fudge. 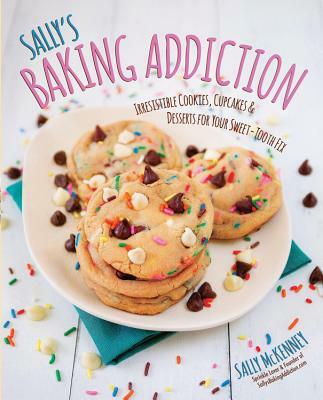 Featuring a brand new selection of desserts and treats, the Sally's Baking AddictionCookbook is fully illustrated and offers 75 scrumptious recipes for indulging your sweet tooth--including a chapter of healthier dessert options for those who follow a vegan or gluten-free lifestyle. With dozens of simple, easy-to-follow recipes, you get all of the sweet with none of the fuss! No one knows sweet like Sally! Sprinkle-lover Sally McKenney is the writer and creator of the blog sensation Sally's Baking Addiction. Obsessed with peanut butter, apple pie, and photography, Sally left a career in finance to dedicate herself full time to the millions of fans who follow her increasingly popular website and her books, Sally's Baking Addiction, Sally's Candy Addiction, and Sally's Cookie Addiction. Sally lives in Bala Cynwyd, Pennsylvania.